What a perfect dish for a cool end-of-winter night. 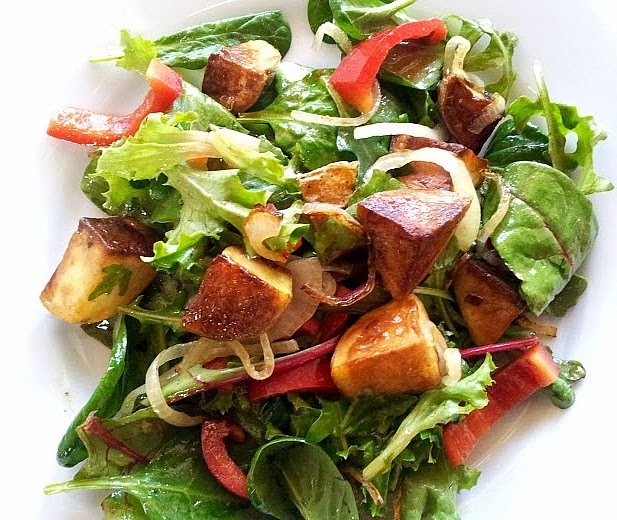 Pan fried Yukon Gold potatoes; golden brown and crispy on the outside, creamy deliciousness on the inside, poured over a green salad tossed with a balsamic vinegar & mustard vinaigrette. 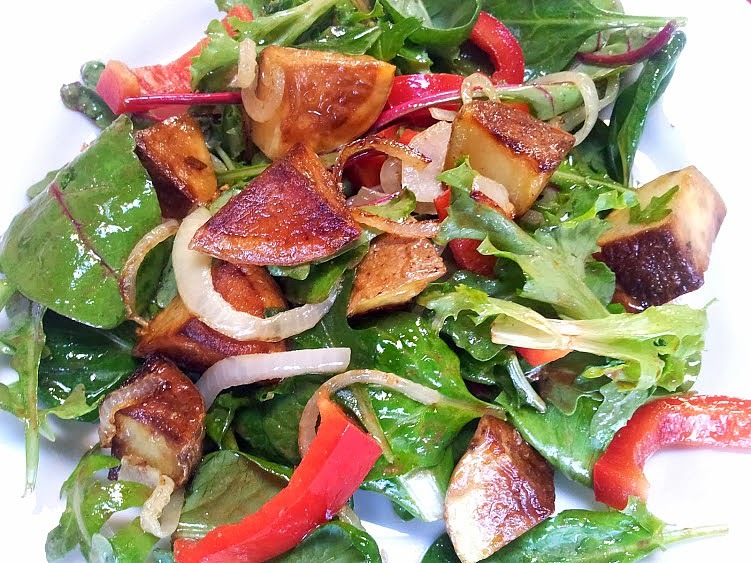 I sauteed sliced onions and garlic in the olive oil left from frying the potatoes and added the caramelized onions and garlic, plus the oil, to the salad. 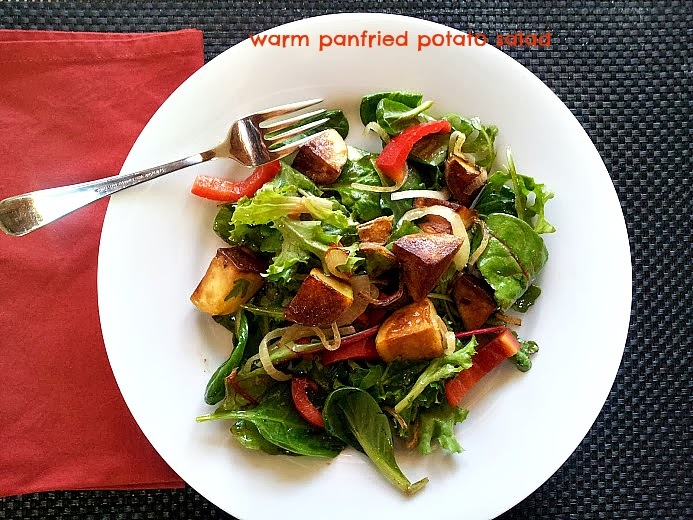 The warm potatoes mixed with the cool salad makes a wonderful contrast. I serve this salad with simple roast chicken or grilled pork chops for an easy weeknight dinner but it is impressive enough to include when entertaining. This also makes a nice light lunch. Enjoy! Cut potatoes into 1 1/2 inch cubes. Heat large skillet over medium high heat. When hot add 2 tbsp olive oil and the potatoes. Sprinkle with a pinch each salt and pepper. Pan fry until one side of cut potatoes is deep golden brown. Turn to another side and pan fry until deep golden brown. Repeat until each side is golden and tender when pierced with a knife. Remove potatoes and keep warm. Add onion to pan and cook until just beginning to caramelize. Add the garlic and potatoes and cook for 1-2 minutes, until the garlic is softened and the potatoes are warm. Turn off heat. Meanwhile, add remaining 2 tbsp olive oil, balsamic vinegar, mustard and a small pinch each salt and pepper to large mixing bowl.. Whisk until emulsified. Add greens and bell pepper and toss with wooden spoons to dress ensuring all leaves are coated. Pour in potato mixture and all the pan oil. Toss again. Taste and adjust seasonings if needed. Serve immediately. WOW that looks so good, I can't wait to try it! What a great idea. Easy and unique. I don't think that I have seen a potato salad quite like this one. I love recipes that have ingredients that I already have on hand. Then I actually do them. This is an unusual salad. I don't think I have been this combo before. Plus it's easy and uses ingredients that I have on hand which means I am actually likely to try it. Visiting from the SITS Girls Spring Fling. 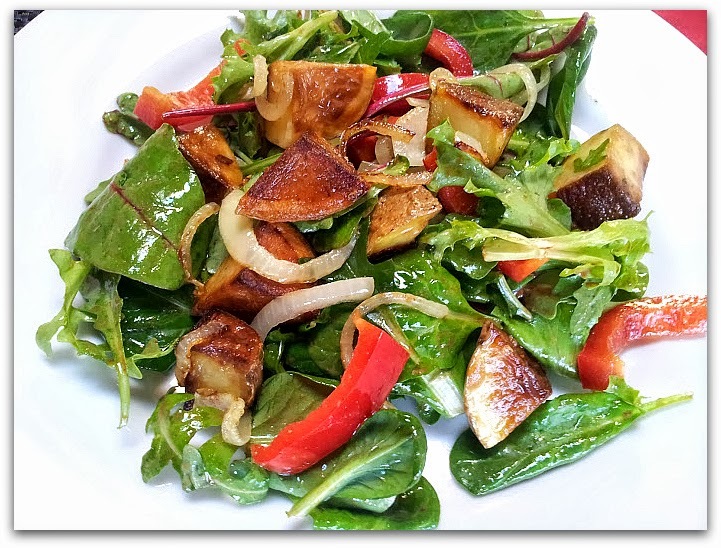 Man that pan fried potato and greens salad looks really good. Some bacon would go nicely with this salad. You can't go wrong with fried potatoes. thanks to all the sits girls for your comments. and, yes beachcomber, bacon would work really well with this salad!